Unashamedly proud. It is fair to say that pretty much sums up my feelings and this story. WE WON. In 2009, when I was the News Editor at the Rossendale Free Press I made a suggestion to the editor that the paper work with a high school to produce a newspaper. There was nothing original in this idea, in fact in the early 1990s I had been involved in several that were produced as inserts in the free newspaper the Rossendale Herald and Post. The editor agreed and Fearns Community Sports College dedicated a teacher Sharin Patel to lead a group of reporters. I met with them regularly and compiled the 16 page newspaper that featured over two weeks. Shortly afterwards, I took redundancy and was immediately taken on by Fearns as press and PR officer and to produce Fearns Chat annually. Last year’s paper – 16 pages of A4 produced in a week – was, I believe, the best yet. I had numerous teachers coming up to me to say they had read it cover to cover and it was brilliant. 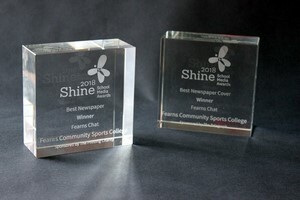 Judges at the national Shine School Media Awards obviously also saw the merit and in July, along with Head Helen Stead and three of the junior journalists, I went to London for the 2018 final when Fearns Chat picked up the trophies for Best Newspaper and Best Front Cover. Very well done one and all. This year’s Fearns Chat was produced in late June. This week may have been half-term but there is no rest for the wicked so they say. As well as compiling and page laying two term-time newspapers for Britannia Primary School and Northern Primary School, I have also been running a hectic News Day at Chatburn Primary School as part of the simply wonderful Wonderful Things programme. Holidays are a long time for parents to occupy tiny minds, along with volunteers, I helped the pupils to become engineers making a wheel from newspaper, architects, creating 3D monuments from newspapers, fishermen – flapping paper fish across the floor, artists painting mastheads. Oh and they also did some writing and word finding. Here’s the finished three-page paper News Day. So back to the contracts. JJO Journal number 13, unlucky for some, has been produced and a cracking read it is too. Stories from JJO have been used across the regional as well as local media. The company is celebrating 150 years in business and is opening a new trade showroom in Rawtenstall. Schools have been crazy bust starting with Haslingden High School, Bryony had her hair cut and as the manager from Antony and Patricia in Rawtenstall Charlotte Jeffs carried out the cut and restyle the story linked two clients. 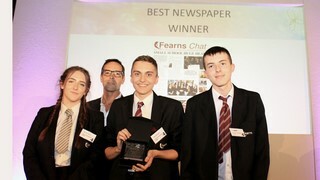 It also made the Lancashire Telegraph and Rossendale Free Press. Other Haslingden High School stories include a London marathon run, an Iceland trip, successfull footballers, a student who landed a grant to help with her drama studies and a garden being created in Matthew Densfield’s memory. At Fearns pupils went on a trip to the University of Manchester as part of the Gateway Project, the school’s librarian is leading the way in a county reading initiative in Rossendale and a former pupil has landed a place at a prestigious drama college in London. Whitworth Community High School also made the press with a story about a sailor making the Lancashire team, a combined singing and music concert and the school’s successful table tennis team. I have produced monthly newsletters for Veterans In Communities and an outdoor special capturing two team-building days at Whitehough Outdoor Education Centre. Press stories have included Lewis making a return trip to the Netherlands, where he had been a despatch rider in the Second World War, veterans building a shed at a school to replace one they put up that was vandalised and a donation from the Ring of Red ride around the M60. Contracts aside I have also had a work experience pupils for a week – well done Emily. Produced a paper in a day at new school Blackburn Heights School and my 10th paper at Sharneyford Primary School. Ad hoc work included promoting the Nowt Poncy range, the Valley at Work Food and Drink Guide, St Joseph’s Football Club appeal for a manager and players, Northern Whisper’s Hop and Grain Ale Trail bus tour and Dementia Friendly Rossendale’s celebration events. Voluntary work too for Bacup and Stacksteads Carnival which is on June 24. I covered the Rossendale Council elections and finally I had a full page in the Big Issue North for Dr Mannan about two Lancashire GPs volunteering to work in a camp for Rojingyan refugees in Bangladesh. Phew. Now for June, which is my busiest time of the year.